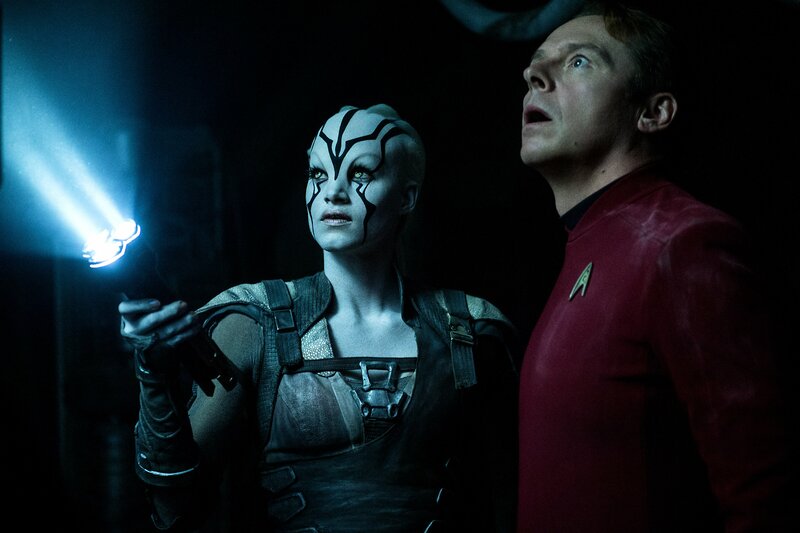 The trailers for Star Trek Beyond have given a pretty strong indication that Pine-Kirk’s Enterprise kicks the bucket in this new movie, until the latest trailer just comes out and says it. The Enterprise has been destroyed. As fans of the series know, this isn’t something new. 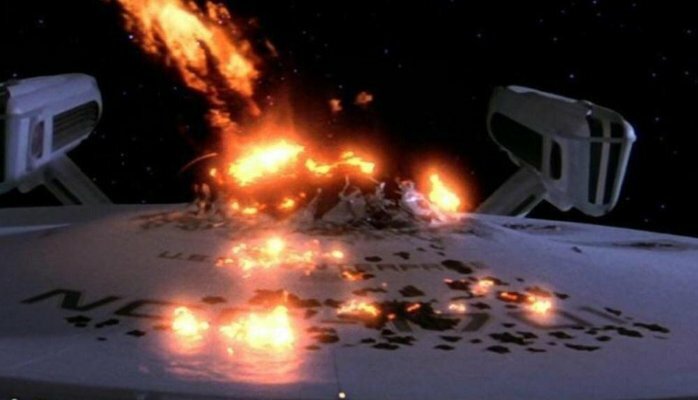 Pretty much every iteration of Star Trek has an episode in which the ship blows up and everyone dies. Actually, if you’re a fan of The Physics of Star Trek, you can add any episode to the list that utters the phrase “Inertial dampers are offline”, because at the speeds they are usually traveling everyone would be a spot on the back bridge wall. Today I will attempt (and likely fail) to provide an exhaustive list of episodes in which the Enterprise (or the main ship/station for DS9 and Voyager) is destroyed. TOS (none): Someone correct me if I’m wrong, but aside from “The City on the Edge of Forever“, in which the Enterprise just disappears because of an alternate timeline, we never see it blow up until Star Trek III: The Search for Spock, still one of the best explosion scenes of the series. Several Constitution class ships are destroyed in the TOS run, but never our main girl. “Cause and Effect” – Ship blows up at the teaser and at every commercial break. We see Frasier as captain of a ship from the 23rd century. “Time Squared” – Seen through future Captain Picard’s log fragments. Especially love the effect of the ship being sucked backwards into a wormhole. “Parallels” – Worf keeps on slipping into alternate timelines including one in which he is married to Troi. Provides the impetus for their brief romance. Enterprise that blows up is one from an alternate timeline where the Borg have assimilated the alpha quadrant. “Yesterday’s Enterprise” – Technically we don’t see either C or D blow up, but C is being sent to its doom, and D is about to be destroyed with Picard at a flaming tactical. “All Good Things” – Several Enterprises are destroyed when trying to seal the breach in the universe, in the wrong order to prevent a time paradox (past, present, future *BOOM*). Star Trek VII: Generations – Lursa and B’Etor are the ones who destroy the Enterprise, at the cost of their own lives. Not exactly what we expected of these characters. We get a saucer crash similar to what we’re seeing from Beyond, though a smoother descent. Data says “Oh, sh-t!” and Picard says the title of this post. Oh yeah, and Kirk dies (as the old joke goes with a bridge on him, instead of him on the bridge). If you read the old technical manual, this exact procedure for saving the saucer was detailed long before the movie came out. “Visonary” – O’Brien is able to make jumps about five hours into the future because of… radiation poisoning? One of his future jumps shows the destruction of DS9 by an unknown (*cough* ROMULAN *cough*) attack. Past O’Brien dies, future O’Brien instead of winking out of existence jumps to the past and assumes past O’Brien’s life. All’s well…? “The Changing Face of Evil” – The Defiant is destroyed in battle with the Breen and Dominion ships. This event is fixed and the Defiant only reappears as the renamed USS Sao Paulo a few episodes later. A bold choice for bold Trek. “The Year of Hell: Part 2” – My personal favorite. Voyager is attacked and battered over a long period. Janeway becomes increasingly driven and prone to taking unnecessary risks. Tuvok loses his sight. 7 of 9 becomes Tuvok’s caretaker and friend. In the final battle there’s a gaping hole in the front of the ship held only by a force-field before Janeway rams Voyager into a timeship to correct the timeline. “Deadlock” – A duplicate Voyager is created through … methods. Harry Kim dies when sucked out a hull breach. Harry Kim prime takes his place, along with baby Naomi Wildman. Duplicate Voyager blows up and somehow doesn’t destroy other Voyager occupying the same space. “Timeless” – Voyager crash lands on an ice planet after being thrown out of a quantum slipstream. 15 years in the future Harry Kim tries to save them by using Borg technology and a retrieved EMH. Cameo by Levar Burton. Another surprising Voyager highlight. “Course: Oblivion” – A duplicate Voyager created by their encounter with the demon planet eventually dissolves into nothing. “Twilight” – In an alternate timeline (catching the trend?) the future NX-01 Enteprise is crippled (the bridge is ripped off which is kind of a cool effect) and later destroyed while simultaneously curing Archer of a brain disease caused by time-parasites. Archer is able to restore his memory and the past. Woohoo. I’m sure there are more so please share in the comments.